This morning we got up early because hubby had an early appointment to get his car checked. It was overcast and cold (39 degrees). Last night after work, we went to Costco and didn't get home until around 9:00. Because it was so late, we just picked up a rotisserie chicken. After we unloaded the car and put everything away, I had a little chicken, a buttermilk biscuit and some fresh blueberries. I sat down on the couch to watch a bit of the opening ceremonies for the Olympics and literally fell sound asleep. I actually woke up on the couch this morning still wearing my clothes! LOL I'm guessing I was tired? After hubby left this morning, I poked around to see what I might want to have for breakfast. 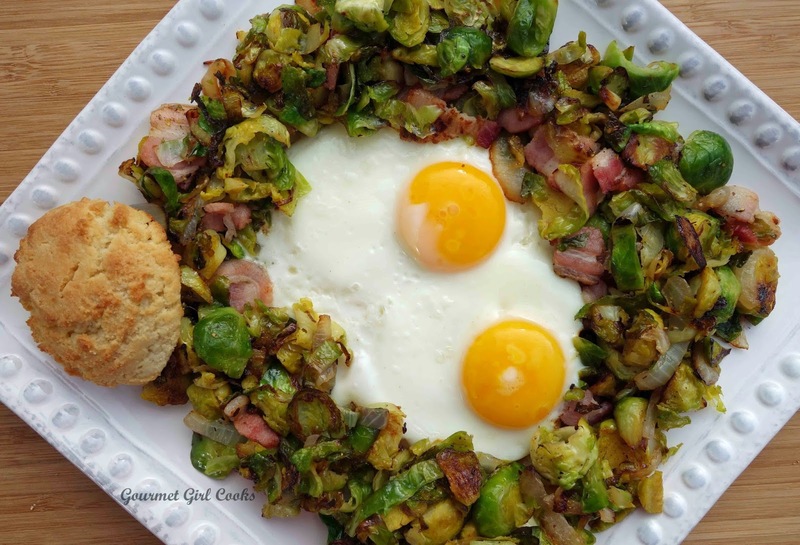 I just happened to have 4 pounds of baby brussels sprouts in the fridge and almost 4 dozen eggs so I decided that it would just be wrong not to incorporate them into my breakfast. I also had some bacon and a little piece of onion left from something made earlier in the week. My breakfast plan was coming together nicely. 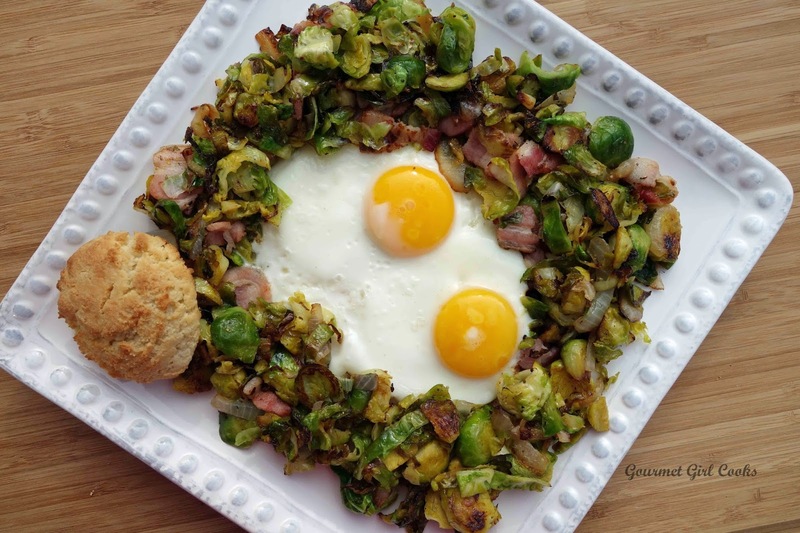 I decided to make a Brussels-Onion-Bacon Hash with a couple of fried organic cage free eggs. I love making this combination because it only uses 1 pan. I thinly sliced my small piece of onion and cut up 2 slices of bacon into about 1-inch pieces. I added a couple teaspoons of coconut oil to my skillet and tossed in the sliced onion and bacon to start cooking. I didn't want to cook it too much because it was going to continue cooking after I added the brussels sprouts, as well. 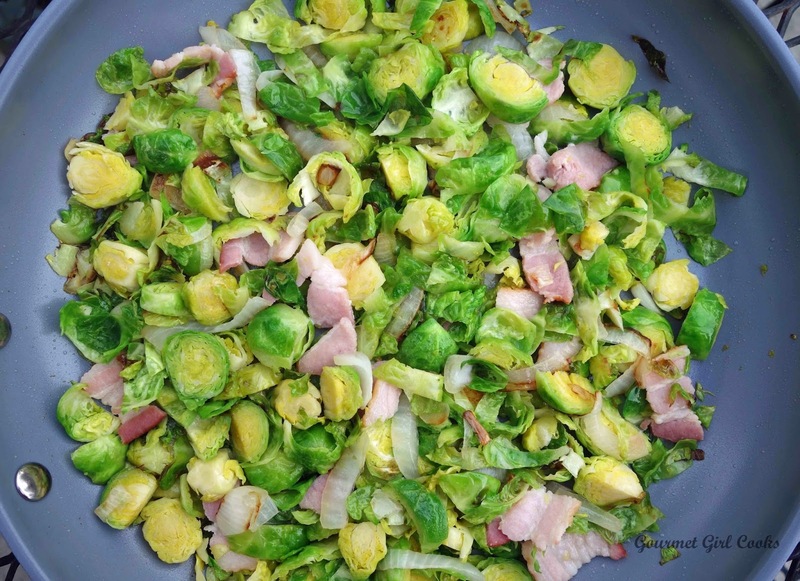 While the onion and bacon were browning, I trimmed the ends off my sprouts and sliced up about 1-1/2 cups of sprouts into 1/4-inch slices -- they don't have to be perfect. I tossed the sliced brussels sprouts into the skillet along with the lightly cooked onion and bacon. I added another couple teaspoons of coconut oil and increased the heat to medium-high and stir-fried for a couple of minutes. To hasten the softening and slight wilting of the sprouts, I added a couple tablespoons of water to the skillet (it began sizzling and steaming immediately) and covered the pan and cooked it for 2 to 3 minutes, just until the sprouts were slightly softened and bright green. I uncovered the skillet and continued to stir-fry (the water had all evaporated) until the sprouts and onions began to caramelize and brown. When the sprouts were almost cooked the way I liked them, I seasoned them with some Celtic sea salt and freshly ground black pepper. I turned the heat to low and pushed the sprout mixture towards the outer edges of my pan, then cracked 2 eggs in the center of the pan, covered it and cooked them gently until they were cooked the way I like them (a few minutes). Covering the pan helps cook the eggs more quickly without having to turn the heat up too high (which makes the whites turn brown). 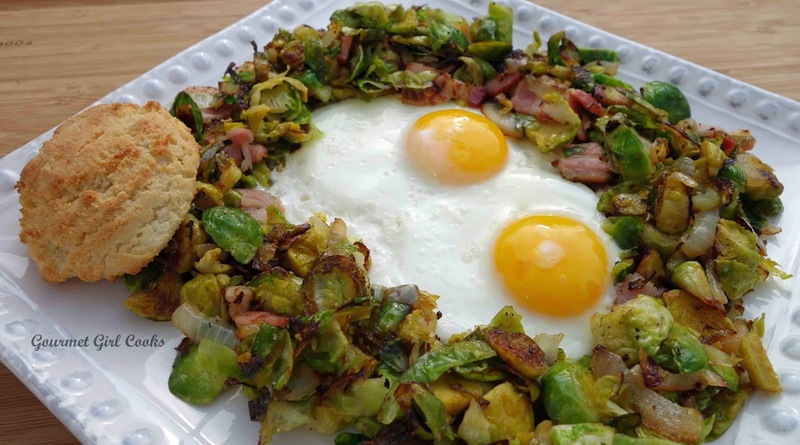 I lifted the cooked eggs out with a spatula and placed them in the center of my plate and spooned the Brussels-Onion-Bacon Hash around them. I heated up one of my Buttermilk Biscuits to go with my breakfast and enjoyed it with a cup of Nantucket Blend coffee. As I was snapping a few pictures of my breakfast, the sun actually popped out this morning. 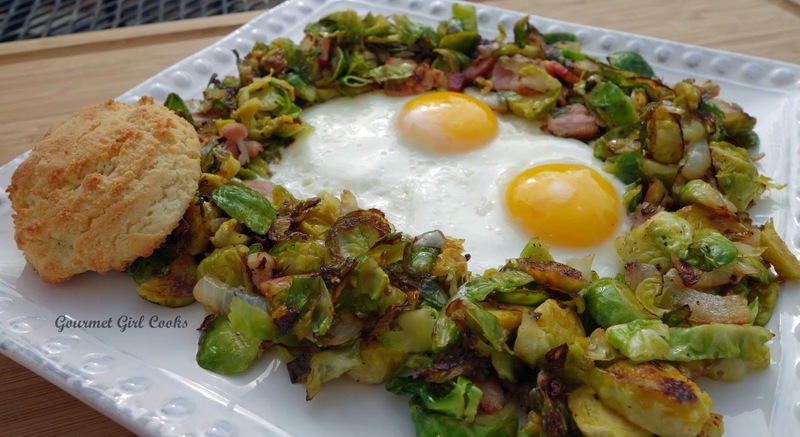 If you like brussels sprouts...and even if you never did before...this "hash" is definitely worth trying. These aren't your mother's brussels sprouts! Now, off to seize the day. Enjoy! Are you saying you actually fell asleep on the couch and stayed asleep the entire night? Wow, if so, I'm guessing you felt really rested today! Good for you! GG. you are eventually turning into * un petit choux*, eating Brussels sprouts so frequently, lol. Congrats to the publication of your TOMATO SOUP recipe in that new WF magazine. How nice and flattering that is ! I use *fire roasted tomatoes* as much as I can! Although it is a forbidden item for people with RA. Your website is getting more fabulous as time goes on. I love the food display on the side of the page. And the back ground color is a perfect choice. I know that I mentioned it before, but it needs repeating! (bad English). Hi GG, yes we got quite a bit of rain, unfortunately we need a lot more to fill the reservoirs. I learned that Georgia is in trouble with too much snow and ice. I hope that you are staying home! Just one more thing. A propos spending the night on the couch: On the way home from the Wine country , I fell asleep and I spent the better part of the night in the car( fabulous seats, that I reclined to the max, I almost was laying flat ). I was so exhausted! My husband never even missed me! Well Gigi, I guess we are way past our honeymoon, lol!